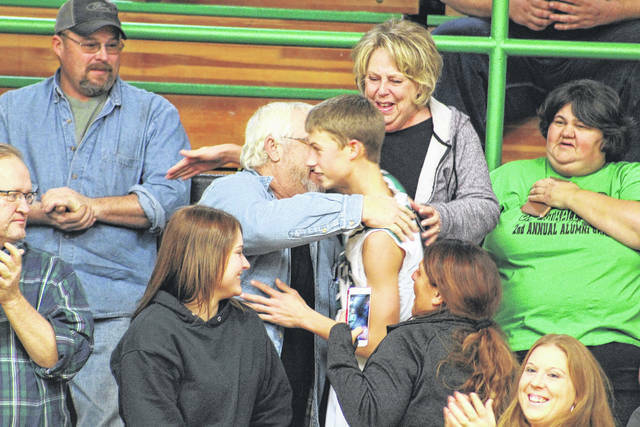 Tanner Kimbler greets his family after going over the 1,000-point plateau. Green head coach Dirk Hollar talks to his team in the huddle. 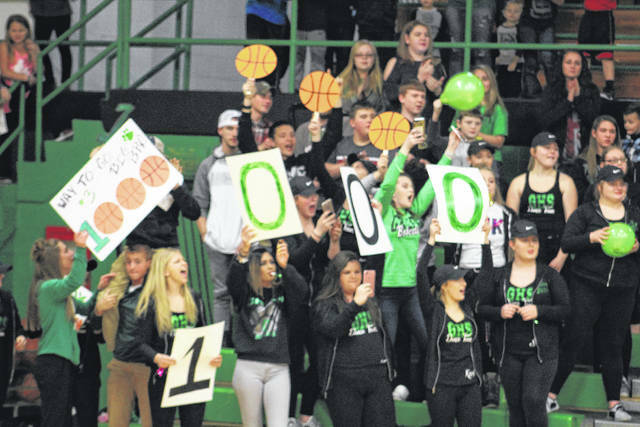 The Green student section holds up the 1,000-point markers for Tanner Kimbler. Franklin Furnace was lit on Saturday night. The community was out in full force for an out of conference meeting between the South Gallia Rebels and the Green Bobcats. 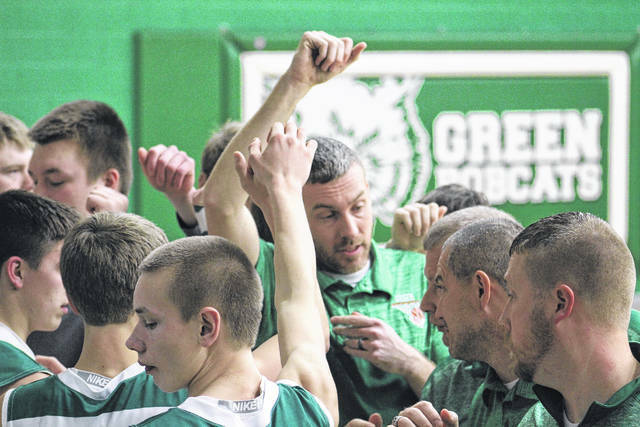 Green was coming off a win Friday night over Symmes Valley, and the Bobcats took on the Rebels in a makeup date from a contest originally scheduled for December 30. In a back and forth battle, Green would win 67-59. As usual, the stands were packed at Green High School. On this night, though, Bobcats faithful had a little extra incentive to cheer for. Junior Tanner Kimbler entered the game with 985 career points, just 15 points away from reaching the 1,000-career scoring milestone. Green fans wouldn’t have to wait long to see the feat before their eyes, as Kimbler continued his scorching hot season scoring wise. In the most fitting way possible, Kimbler accomplished the goal with 1:34 to play in the second quarter on a four-point play. When the shot left his hand, Kimbler was four points away from 1,000 for his career. With the made three and made free throw, he had hit the total perfectly. Kimbler said he knew he was close, but was trying not to think about it during the course of the action. After the three went through, Kimbler knew he was near. “The cheer block and all the fans went crazy, so I kind of figured it out,” Kimbler said. Play was stopped following the accomplishment so Kimbler could be recognized and talk to friends and family in the stands briefly. Several members of the Rebels team also came to congratulate Kimbler for his record. Green head coach Dirk Hollar has gotten to know Kimbler well over the past three seasons, and was ecstatic for his guard. Hollar says Kimbler is more than just a scorer, though. Kimbler sees himself as a spark plug for his team, trying to get everyone involved in a role he encapsulates well as essentially a true point guard. You can tell he appreciates his teammates and supporters, and he made sure they knew after the game. In the end, Kimbler finished the contest with 29 points to lead all scorers. It took Kimbler, as well as the efforts of several others, for the Bobcats to pull out the victory. Every time Green would begin to pull away early, South Gallia had a quick response. With 1:45 to play in the opening quarter, Tayte Carver sank a three to give his Bobcats a 16-13 lead. Carver racked up 17 points in the game. On cue, the Rebels retaliated with a quick five points from Braxton Hardy on back-to-back possessions. Hardy finished with a team-high 26 points for South Gallia. A score from Gage Sampson with five seconds to play in the first knotted the count at 18 all after one. In the second quarter, neither team could establish themselves any further. The four-point play for Kimbler made the score 30-28 in favor of Green, but the Rebels struck back with a basket from Austin Stapleton. Stapleton scored six points in the game, and made it count on several broken presses from the Bobcats. Kimbler regained the lead for Green with another trey at 30 seconds to play before halftime, but Jared Burdette countered with his only triple of the game to tie the contest at 33 at the break. The difference in the game would soon be set, as Coach Hollar had some words of inspiration for his bunch at the half. As Hollar outlined, the game would continue to shift to each side. However, the Bobcats would grab a big lead to start the third quarter with a solid combination of offense and defense. Green scored the first 15 points of the third quarter, playing a nice inside outside game with their shooters. Carver was big on the run, scoring eight of the 15 points for the Bobcats. It took South Gallia until the 3:08 mark of the third before they would score their first points of the period. Eli Ellis broke the slump for the Rebels, and was big throughout the night with 22 points. By that time, though, Green had already built a 48-35 lead. The Bobcats would coast with that lead until late, when South Gallia responded with a 7-0 run to close out the third to make the score 53-44 after three. Green came back with a 7-2 run to open the fourth, and with the 60-46 lead were well in control. The Bobcats would allow the Rebels to inch closer at times, but South Gallia wouldn’t get closer than seven points in the deficit. Those late runs were crucial in what would become a 67-59 victory for Green. Still, it offered Coach Hollar a glimpse at what could potentially be problematic for his team down the stretch. The Bobcats (7-5) have a conference date on Tuesday with Notre Dame, and will play Clay on Friday. “I’m good friends with Tiny [Anderson], and I know he’s going to have some things ready for us and mix it up a bit,” Hollar said. Green will play both the Titans and Panthers at home in what will be two big time games to get some distance in the conference standings.